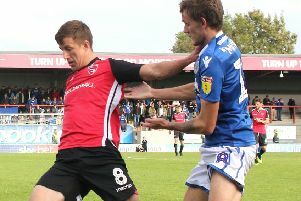 Jim Bentley has said Morecambe hope to have good news over new deals for some of their existing players. The current Shrimps squad is a mixture of players on one and two-year deals with Rhys Oates, Andrew Tutte, Sam Lavelle, Steve Old and Jason Oswell on the latter contracts. In contrast, A-Jay Leitch-Smith and Zak Mills - both of whom have impressed this season - are among those players who are only on 12-month deals. Florent Cuvelier and Garry Thompson are on shorter contracts than that with their deals set to expire next month. Bentley told Thursday’s fans forum: “We have some on contract for next season but we’re looking to secure some of our better players sooner rather than later. “We’ve had a conversation regarding options (for January) but it’s not for me to sit here and say we’re looking at this and that. Leitch-Smith would be seen as a priority given his impact since joining the club in August. The 28-year-old is top of the club’s goalscoring charts with six but he could easily have been in double figures by now. Bentley said: “He missed a bit of pre-season but it’s similar to what we did with Shaun Miller in that we always find someone who has lost their way a bit. “You could see he was a class act but he’s found the last couple of years difficult. “He will only get better and he should be on more than the six goals he’s got at the moment.